So what is the deal here? I am not reviewing an actual book here but instead going to talk a little bit about the cover art. I like to talk a little bit about the covers of each book I review, but did you know a lot of the books have several different covers? 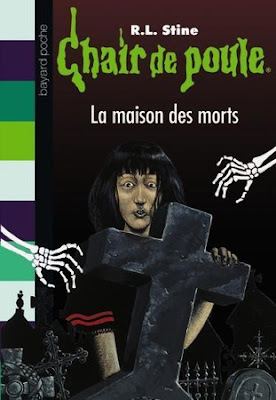 There are the original cover, reprint covers, re-reprint covers, foreign covers, etc! Now maybe it's just my nostalgia talking or perhaps I'm a purist but personally I like the original borders better. Still it is nice that they kept the original art. I am a fan of the covers Jacobus made. 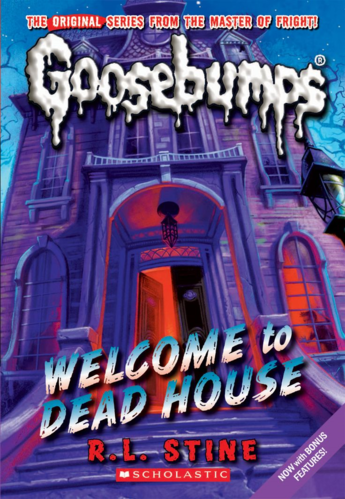 Though Dead House is perhaps one of his less interesting ones because it's just a spooky house... but hey, it's a pretty good spooky house right? 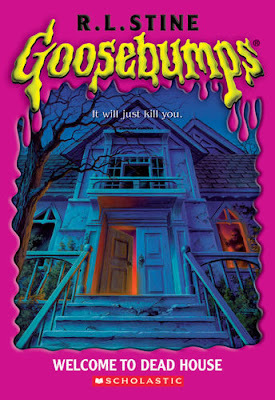 Later in the 2010s they would begin re releasing the original books again but this time with updated art that was more in line with the current series of new Goosebumps Stine was still releasing. The art is totally redone but for Deadhouse it keeps the same basic idea and tone. Spooky house. Kinda bluish/purpish. Flashy fonts and whatnot though. This time there is no border, which is actually kind of nice because none of the art is cut off. It makes it look real nice. Of course reissues weren't the only reason to get different cover art. Goosebumps has been released in different languages all of the world. A lot of times they just use the original art but obviously translates the titles. This makes a lot of sense to me. Why spend time and effort to redo art when there is already perfectly good art to use already there. Maybe there were rights issues? Maybe it cost money to use that specific cover and they could save it by hiring someone else? Maybe they just thought a different market had different art sensibilities? I don't really know. In the UK it seems like they liked their covers to be... liquidy? 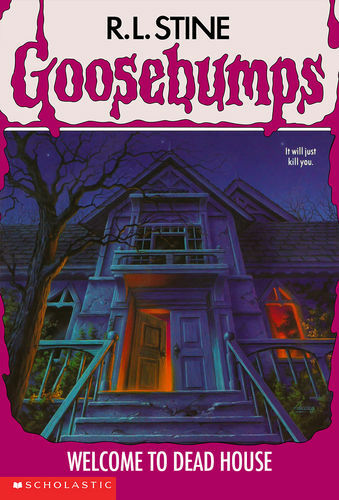 See this cover just seems kind of... UnGoosebumpy to me. It doesn't seem fun, it doesn't seem kid friendly. It seems like the cover of an unrelated book they just borrowed. Also what's going on here. Did the shadow of this girl's mother tell the girl to take off her headphones? Maybe they opened a haunted cardboard box and unleashed a ghost? I don't know..
Now that we've seen what Europe has to offer, what about Asia? Well Japan it seems, liked to stick with the cover of Welcome to Dead House actually having a... Dead House. Now it's perhaps not as spooky seeming as a house as the US covers but it is still a bit eerie. It seems a little less dilapidated and more lived in. But who is living there? THE DEAD?!?! Plus that sky is also unsettling. Also there are some drops of blood next to the title. That is pretty badass. Maybe a little too badass for the pretty bloodless series of books this is... What does Korea have to offer though? 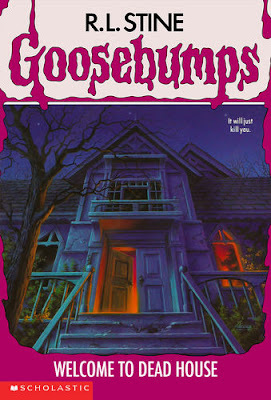 Well they thought that spooky house was pretty lonely without a pale little girl looking slightly perturbed. She is thinking "gosh dad why did you have to move us into the DEAD HOUSE? Didn't the name mean anything to you, god you're so embarassing!" But anyway this cover certainly has it's own style going for it. Slimey kanji look kinda funny. 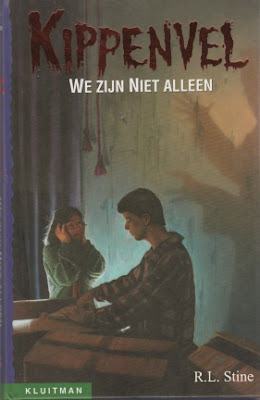 So there you go, these books had lots of covers. Here is just the first in the series and look how many it has around the world. I am hoping to show off more from the rest of the series, but perhaps do multiple books in one post and just cover some of the more interesting ones. 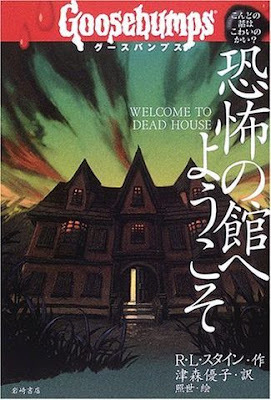 I admit that Dead House is perhaps not the most interesting book coverwise to go over but hey, it's book #1! So hey, if you found this interesting, feel free to let me know. 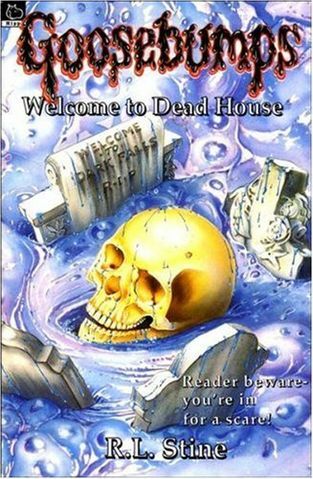 Also if you know of any other alternate cover art for Welcome to Deadhouse I didn't cover, tell me about it. Until next time, when I'll have an actual book review, thanks for reading.